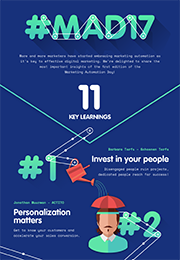 The most important insights and conclusions from Marketing Automation Day 2017 rolled into one crystal clear infograph. Grab and enjoy! Want to revisit the presentations by your favourite speakers at Marketing Automation Day 2017? Download them here and read them on your laptop or tablet. It’s time to get personal. Why personalization is key. Want to receive updates on event dates, speakers and themes? Subscribe now and enjoy a 10% discount on the ticket price for next year’s Marketing Automation Day. Our audience feeding their heads with the newest marketing automation trends, networking with peers and colleagues or simply enjoying the moment. Can you spot yourself? RAAK develops marketing programs tailored to the need of your target audience(s), based on targeted data, insights and best practices. A broad knowledge of marketing platforms and a dedicated in-house studio make RAAK a full-service partner for every marketing automation and email marketing project. The result: a better brand experience, stronger engagement and a higher conversion rate. ACTITO is a powerful and user-friendly agile marketing automation platform developed specifically for the contemporary and flexible e-marketer. Designed from a 360° customer view this tool helps professionals to plan, create and roll out hyper-personalised cross-channel campaigns fast and efficiently. Complete your details below to get direct access to all presentations given at Marketing Automation Day.